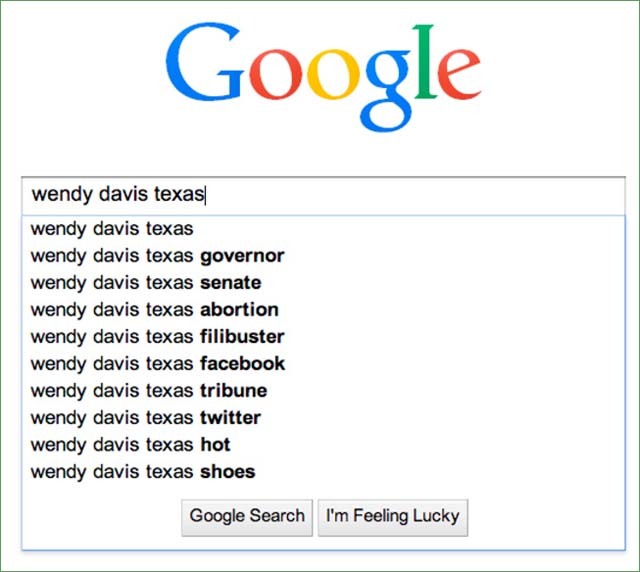 Is Texas State Senator Wendy Davis – a Democratic candidate for governor – a secret Latina? They assert that Davis is the Anglo version of Juana; that Davis was born into a Mexican family in Oklahoma, and after successfully using her heritage and gender to get into Harvard Law School, she descended on the Lone Star State to reclaim Texas for Aztlán. Davis gained national attention in June with a filibuster against a Republican bill to severely restrict abortions (while wearing sneakers.) She officially announced her candidacy on October 3. “There’s no way a real Texan, would be on the side of Latinos in this state — haven’t you been paying attention?” asked Mary Jones, founder of the North Texas Tea Party Patriots, who is also an Obama birther. Connie Mendez, a insurance agent from Mercedes, Texas, said that Davis had LatinoS’ affectionS because, “She uses Nice ‘N Easy natural light blonde como nuestras tías” to dye her hair. “Like many of us, she was the first person in her family to graduate college,” Mendez added. While these Davis birthers’ concerns have yet to catch fire nationally, Jones did say she had a Twitter exchange with famous Obama birther Donald Trump. No word yet on whether he would be investing money leftover from his latest bankruptcy to investigate the Davis matter.